The USDS was designed to provide real-world RF laboratory and field measurement teams a versatile Comb Generator broad-band electric field source with unique circuitry to allow Quasi-Peak Detection verification! The USDS source can be used for many EMC applications and problems because of its repeatability, accuracy, physical size and electrical isolation. The USDS is a unique product, a radiated E-field source that addresses many requirements in both the research and test community. This RF signal is internally generated by a stable Comb Generator (CG) and amplified to create a highly repeatable RF source. The fundamental frequency of the CG is factory set at 10 MHz, but can be adjusted by the operator to any of 4 fundamental frequency settings (10, 64, 100 and 133.3 MHz). The USDS is typically used to generate radiated uniform E-field levels the spherical dipole antenna. Alternatively, direct injection of the CG RF signal can be achieved simply by removing a hemisphere and connecting directly to the SMB coaxial connector. 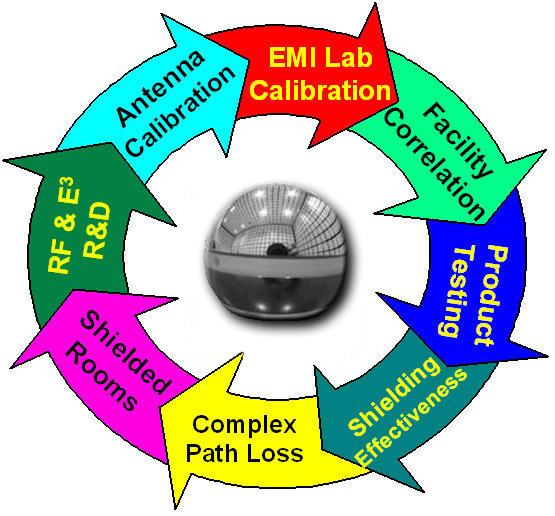 Ideal as a RF source for daily emission measurement equipment checks, and is especially unique to provide laboratory assessment of equipment Quasi-Peak detector performance. Applicable to OATS, GTEMs, semianechoic or shielded rooms, and any standard or complex RF test environment. The small radiating element (10cm. in diameter) makes the USDS source ideal for inside very small (or large) enclosures for quick-look shielding effectiveness measurements. The USDS is stable and battery isolated, so that the same electric field can be created whenever desired, where ever the source is required. The source is physically small so that it will resemble a "point source", and so its physical size is not a concern during antenna calibration or verification. The USDS is physically repeatable so once the source is turned on and in proper position, there will be no effect from the coaxial cables, power cables, ground loops, or metal walls.